Flames are the visible part of the chemical reaction involved in burning. Depending on the nature and the amount of the fuel and the oxidant (eg. wood and atmospheric oxygen) they can be of many shapes, color, and intensity. Coincidently, they can emit different sounds in terms of tone, dynamics, amplitude and bandwidth. 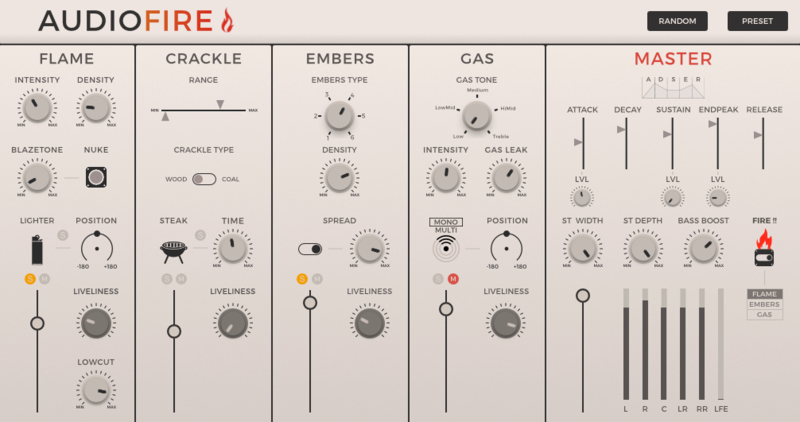 This module uses subtractive synthesis to generate these various types of flames to meet various needs. As fire burns, the combustible material heats up and with it the liquids trapped inside ( like water and sap in wood logs). Soon, liquids turn into gazes and exerts pressure towards the outside until it pops out and emits the typical crackle sound we naturally associate with fire. When carbon based materials are consumed by fire, they slowly turn into embers. The combustion is still happening but at a very slow pace because the oxygen doesn’t circulate easily to the combustible core. They often produce a gentle crackling, hovering soundbed and sound differently according to the materials and the temperature of it.This module uses granular synthesis to generate constant, ever-changing textures. When there’s fire, there is gas involved. Mostly naturally induced like the oxygen as the origin combustion or carbon dioxide as its result. But sometimes there’s also man induced gazes, used as combustibles like butane or propane. Theses gazes comes out of our ovens, stoves, water heater … with systems designed to control and restrain their flow (that sometimes fail and cause accidental fires).